Home » Seasonal and Holidays » Easy Vegan Eggnog (Dairy-Free, Gluten-Free)! Creamy, thick, and irresistibly delicious; this easy vegan eggnog recipe also happens to be eggless, refined sugar-free and dairy-free. 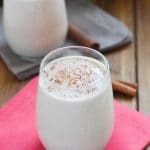 It’s the best vegan eggnog (with no banana or coconut) and spiced just right. 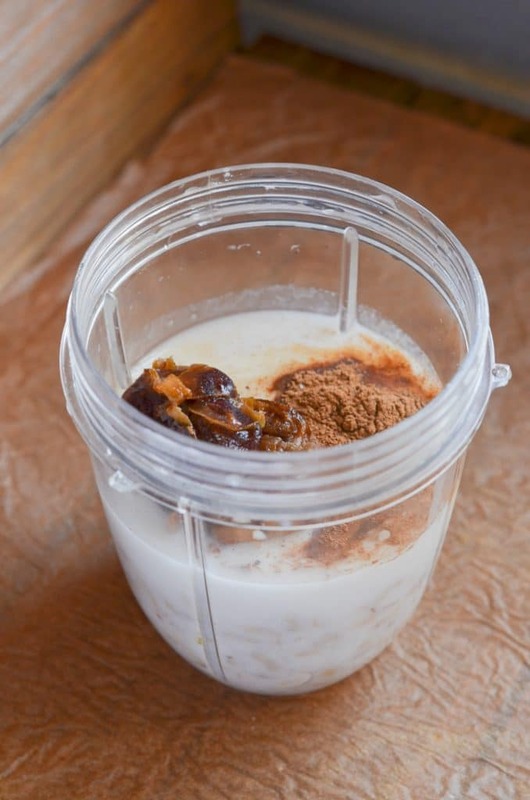 With a few shakes of freshly ground nutmeg, your new healthier holiday beverage will look quite festive! Cashews make one of the thickest dairy-free milk and have a mild taste, which makes it perfect for this vegan eggnog recipe. If store-bought dairy-free eggnog additives are bothersome to you, this is a perfect alternative. 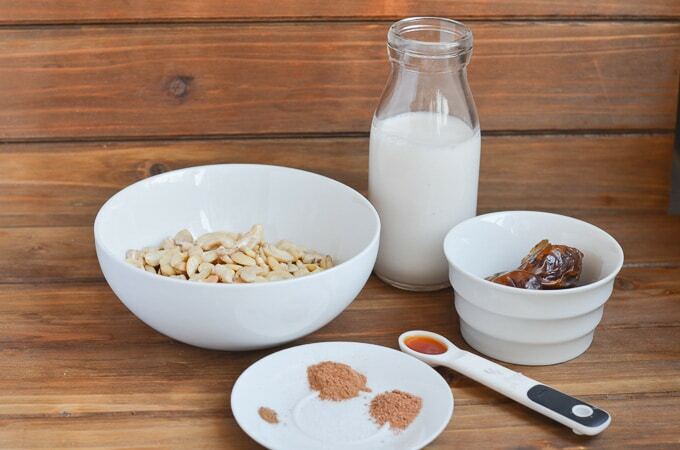 The Medjool dates naturally sweeten this easy vegan eggnog. And with this recipe, there is no worry about consuming raw eggs as with traditional eggnog. 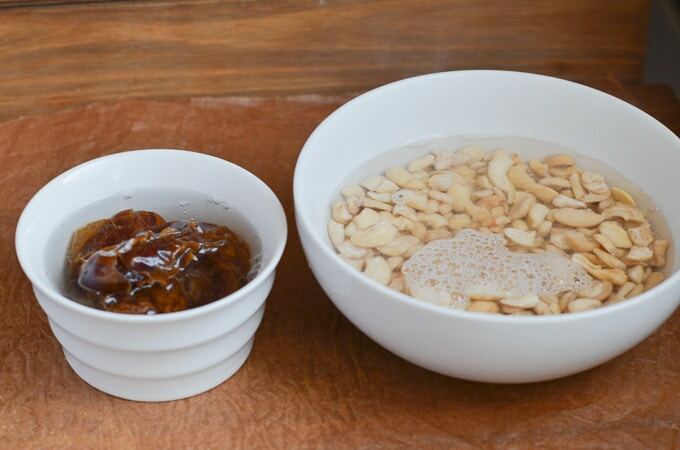 Step 2 – Soak the cashews and dates by placing in a bowl (one for each) and covering with hot/boiling water. Let soak for 10 minutes. Step 3 – Drain and rinse the cashews. Drain the dates, remove the pits if not pitted dates, and save the “date water”. Step 4 – Place all the ingredients in a blender. Step 5 – Blend the ingredients for several minutes until well combined. Add additional liquid (saved “date water”, water, almond milk) if necessary for desired consistency. Store in a glass container in the refrigerator (up to 5 days). Refrigerate for about one hour prior to serving (if serving cold). Pour into a glass (or two), add garnishes of cinnamon sticks, a sprinkling of ground nutmeg or cinnamon, some pomegranate seeds or a splash of liquor (like rum)! May substitute the almond milk for another dairy-free, vegan milk (e.g. coconut milk). 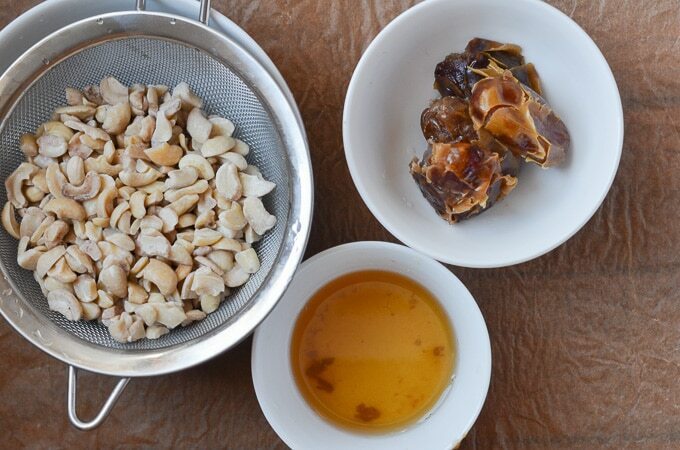 Substitute regular pitted dates for the Medjool dates. Soak as per the instructions. Enjoy this drink warm or cold. If serving cold, place in the refrigerator for about one hour prior to serving. Garnish with cinnamon sticks, freshly ground nutmeg or cinnamon, or pomegranate seeds. Make ahead option – make a few hours before serving. Store in the refrigerator for up to 5 days, however, you may need to blend it up again for best consistency and texture. Enjoy and Happy Holidays! This just may be the simplest holiday recipe of the year! Add a bit of your favorite liquor (some ideas…rum, bourbon or brandy) and pop on the holiday music! The Best Easy Vegan Eggnog! 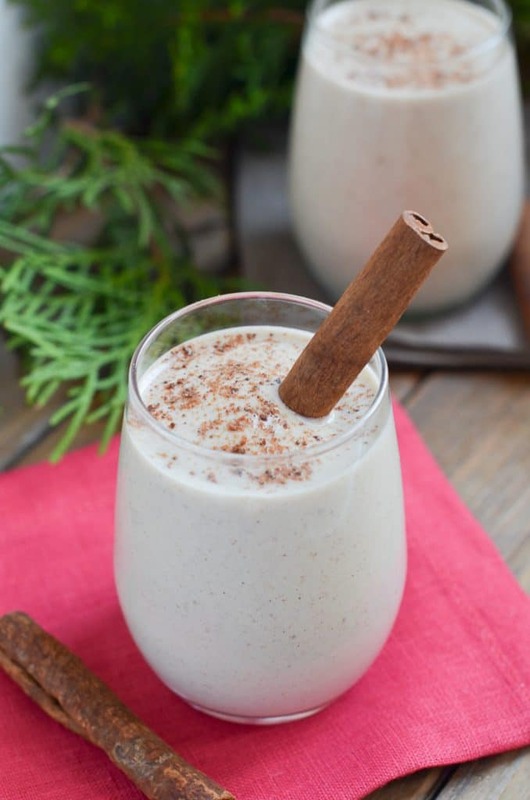 Vegan eggnog - Creamy, luscious and healthy holiday drink with a rich, creamy flavor. grain-free, gluten-free, dairy-free and amazing! 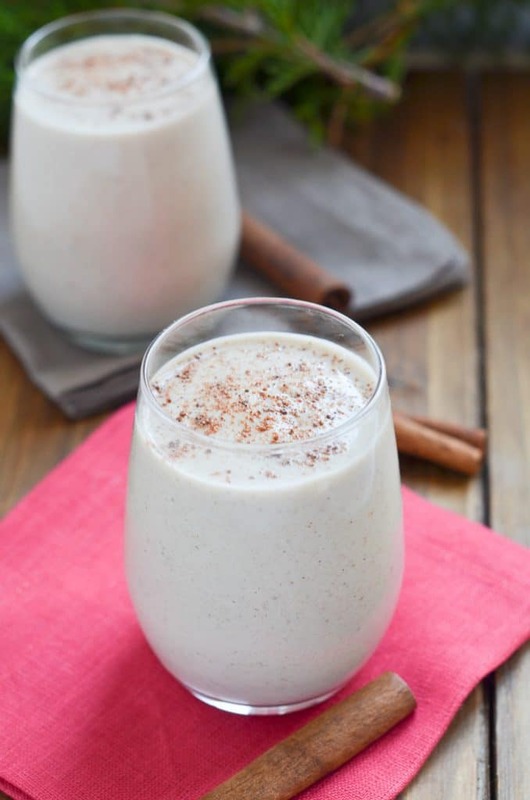 The cashews, dates, and spices give this eggless eggnog an amazing authentic taste. Try adding a bit of liquor for a festive Christmas beverage! Place the cashews in a bowl and cover with boiling/very hot water and set aside to soak for 10 minutes. Rinse and drain and place in the blender. Place the dates in a bowl and cover with boiling/very hot water and let soak for 5-10 minutes. Drain and remove the pits. Place in the blender. Add the ground cinnamon, nutmeg, vanilla, pinch of cloves and sea salt to the blender and blend for about a minute or two until combined and creamy. Add extra liquid (saved "date water", water, almond milk) to get desired consistency. Pour into glasses and garnish with a sprinkling of ground nutmeg or cinnamon. Make ahead option - make a few hours before serving. Previous Post: « Easy Paleo Cranberry Sauce!